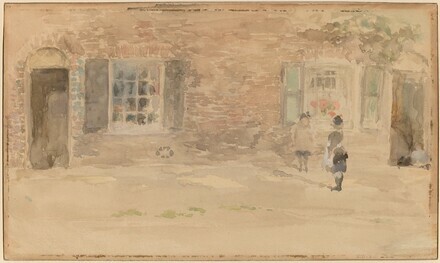 (Brown & Phillips, London), 1903; John P. Elton, Waterbury, Connecticut; his granddaughter, Lucy Cross; Private collection, Los Angeles; (Hope Davis Fine Art); acquired 1988 by Mr. and Mrs. Paul Mellon; gift 1991 to NGA. Art for the Nation: Gifts in Honor of the 50th Anniversary of the National Gallery of Art, National Gallery of Art, Washington, D.C., 1991, 222-223, color repro. Art for the Nation: Gifts in Honor of the 50th Anniversary of the National Gallery of Art. Exh. cat. National Gallery of Art, Washington, 1991: p.222. MacDonald, Margaret F. James McNeill Whistler: Drawings, Pastels and Watercolours: A Catalogue Raisonné. New Haven, Connecticut: Yale University Press, 1995, no. 950.